Last Saturday, the day got away from us. We ended up sitting at home for quite some time, waiting for something to get done before we could leave. It was 4:30 pm before we finally got out the door. I wanted to check out some stuff at South Hills Village Mall so we headed that way. When we got to the Route 19 & Ft. Couch intersection, I checked No Wait, just to see what the BRGR wait was because I do not like Red Robin or mall food court food, our last trip to that Eat'N Park was less than satisfactory, and there just aren't many restaurants in that area I like. There was no wait, so since it was 5 pm, we decided to have a bit of an early dinner to avoid any future wait. 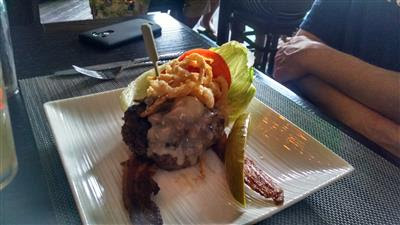 We were seated right away, ordered iced teas and a beer for SP, and he decided to have a bunless Bison burger with bacon, cheese, onion straws, tomato and a lettuce wrap. He said it was tasty. I thought it looked kind of small, especially compared to Burgatory. Since I didn't want to leave any potential leftovers in a hot car or tote them around the mall, I opted for 2 appetizers instead of a sandwich. 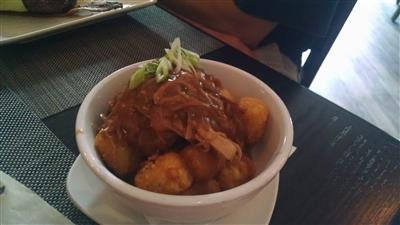 First, Pork-N-Tots (confit pork over crispy tater tots, gravy, smoked gouda cheese, green onions). These were good, juicy shredded pork, but I didn't taste any smoked gouda and neither did SP. Lack of smoked gouda flavor was disappointing. 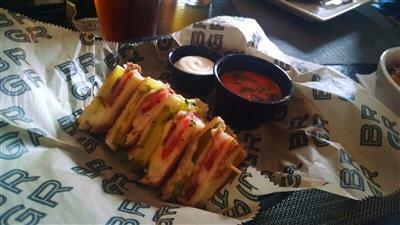 My other appetizer choice: Grilled Cheese Bites (provolone, applewood smoked bacon, truffle aioli, tomatoes, pickle chips, on grilled Texas toast, served with a side of tomato fondue). We both were disappointed in these. They were less cheesy, less bacony, and more pickley than we remembered. Overall, I was disappointed. 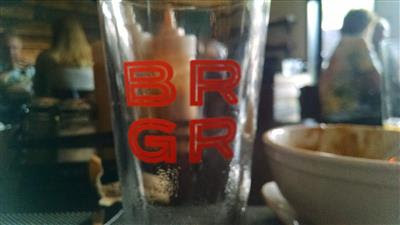 The first two times we went to BRGR at the Galleria, we had greats service and enjoyed our food. The last 2-3 times, we've had so-so service and less tasty food. Two visits ago, there were long waits to order, to get our food, to get the check. This time, our food arrived quickly and we felt rushed. Our server dropped off the check without checking to see if we wanted dessert. The burgers still look kind of small and sad without any fries/chips next to them like at Burgatory. You can get fries as a side for an extra cost. The fact that SP was willing and able to help eat a grilled cheese bite and some tots tells me his burger didn't fill him up.